Softcover. The 26th issue of Ripperologist. 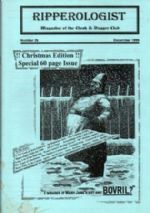 Christmas Edition Special 60 page Issue. The Cloak & Dagger Club was founded to study all aspects of Jack the Ripper and the unsolved Whitechapel Murders of 1888. It also aimed to study and promote the history of Whitechapel and Spitalfields. The Club meetings were held 4 times a year with a guest speaker at each meeting. Now known as the Whitechapel Society 1888, it currently holds meetings every 2 months. 60pp. Illus. A4 size wraparound magazine format. With small beverage stain to lower edge of fr. cover but still Vg.